Every year as Earth makes it way around the Sun, it reaches a point where it is in line with an outer planet like Saturn. This is called opposition. 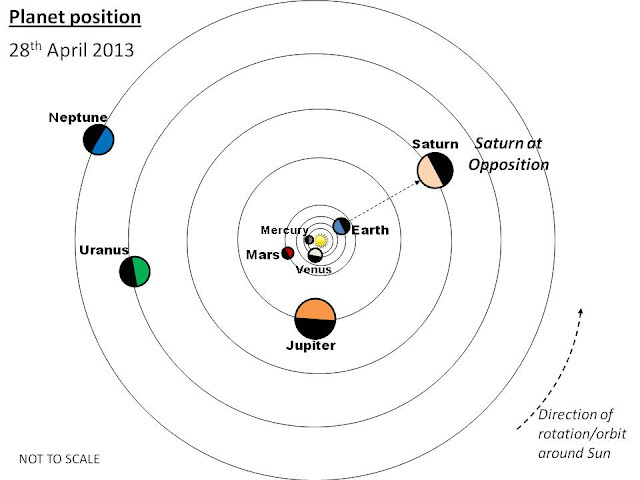 This year Saturn was at opposition on Sunday 28th April 2013. This means that Saturn has now started to appear in the eastern part of the sky during the early evening and appears at its brightest and biggest over the next few weeks. Saturn on 26th April 2013 at 10:20pm. - Taken with a HTC One X+ phone camera through a 16 inch cassegrain telescope with a 13mm Nagler eyepiece. I was quite impressed at how this photo turned out, considering it was take with a phone camera held in front of the eyepiece. The fact that I was using an expensive, high power eyepiece lens (13mm Nagler) also helped. Each year Saturn's opposition occurs about two weeks later than the previous year's. By the time Earth's returns to its previous position after its 365 day orbital journey, Saturn has also moved about 1/29th of the way around its own orbit. As a result we see Saturn slowly drift in font of the the more distant star and constellations. Currently Saturn is making its way through the constellation Virgo. At next year's opposition it will be closer to Libra. Observing Saturn each year, you may begin to notice a change in the appearance of its rings. That is, some year you see more of them than others. Like the Earth, Saturn is tilted. Its poles are tilted by about 26.7 degree. Depending on Saturn's position along its orbit we sometimes see Saturn tilted towards us or tilted away from us. Back in 2009, Saturn was not tilted towards us at all, resulting in an edge-on view of the rings, making them appear very thin. Saturn in 2009 - a thin edge on view of the rings, as seen from Singapore on 20th March 2009, looking East through our main telescope (16 inch cassegrain), with a Nikon D70 DSLR camera. Note that the vertical orientation of the rings in this photo has nothing to do with Saturn. It's because of our position on Earth. Here in Singapore, we are standing almost 90 degree from the north pole, thus we are standing sidewise relative to Saturn. Late last year I was informed of a video (on youtube) that was using this very photo (amongst others) to falsely claim that Saturn has been knocked completely off its axis, signalling the end of the world. The video has since been removed and the world is still here. 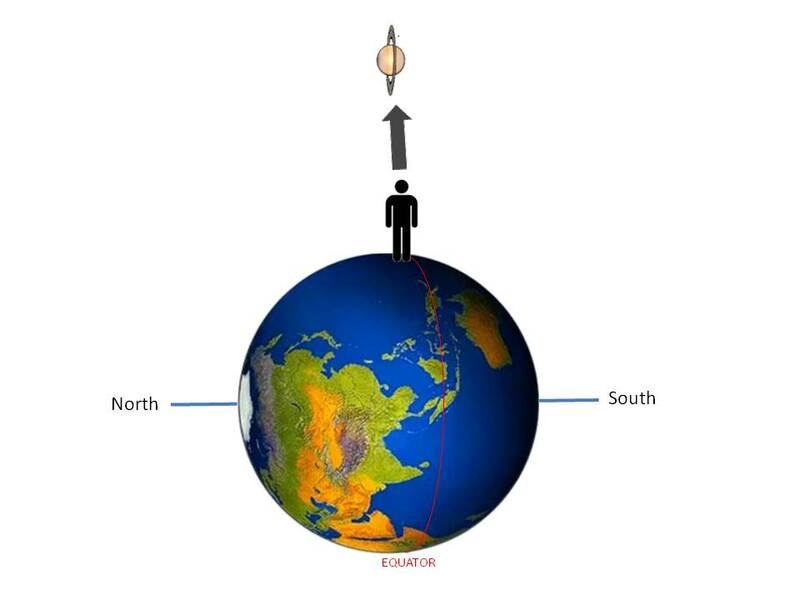 Due to the curved surface of the Earth, observers in different locations and time periods will see Saturn at different angles. Of course, I could have just rotated the camera or the photo to match Saturn's actual orientation. Over the last few years, Saturn's "natural tilt" has resulted in its north pole facing more towards the Earth, resulting in the rings appearing wider and wider each year. 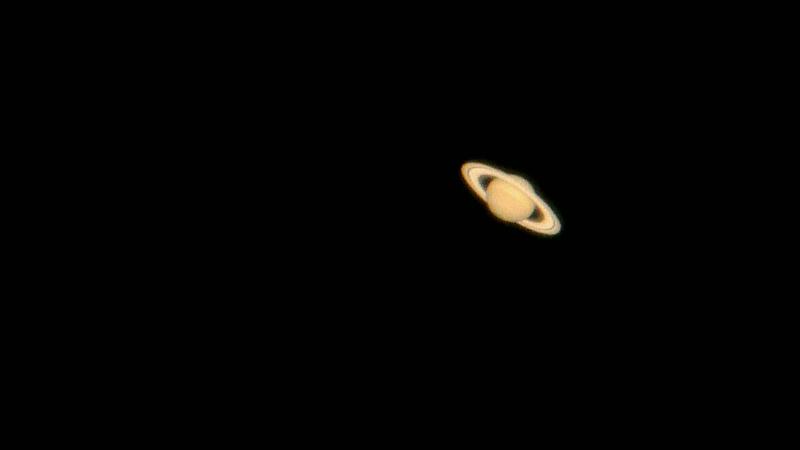 Saturn in May 2011 - taken through our 16 inch cassegrain reflector using a Nikon D70 DSLR camera. 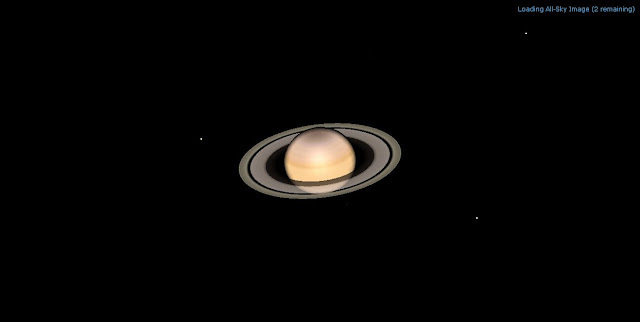 Saturn in 2012 - taken through our 16 inch cassegrain reflector with a Nikon D70 DLSR camera. Rings look slightly wider than in the photos from 2009 and 2011. By 2017 we will have the widest possible view of the Saturn's rings. After 2017 the rings start to appear smaller again as Saturn's north pole begins to turn away from us. Saturn Rings in 2017 - Screen capture from astronomy software Starry Night Pro Plus. Finally, Saturn is bright enough to see without the aid of the telescope as a bright yellowish dot in the sky, just slight east of the a bright whitest star in called Spica (part of Virgo). Each night over the next few months, its will gradually shift more towards the western part of the sky before disappearing from view around September/October time. Each month the Moon will pass by Saturn in the sky. Look out for Saturn beside the Moon on 23rd May and 19th June.